Tax Refund Suggestion. Oh there’s so much you can use your tax refund for, but what about making your car look and feel new again with the services of Atlanta Dent Company. Tax Refund Suggestion. At Atlanta Dent, Interior Magic, and Atlanta Auto Color, we offer three companies in one to serve all of your auto repair needs with one call instead of three. We offer paintless dent removal, interior restoration, and paint repair services and much more using only highly trained, reliable, and certified technicians. We work on all makes and models. Call us today or click here for a free estimate. Tax Refund Suggestion. Do you have a Tax Refund coming back to you this year? Do you have a car that has needed refurbishing inside or out for a while now? 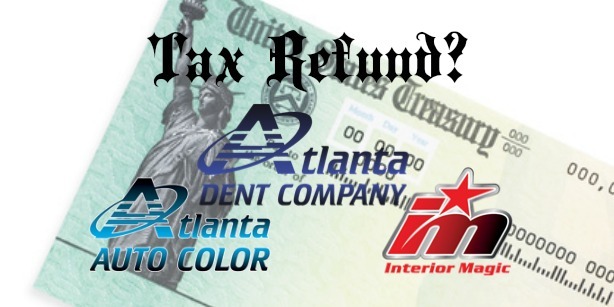 Atlanta Dent, Interior Magic, and Atlanta Auto Color can help make the most of your tax dollars making your car look new again.